A 5-level campaign set in the Hyperspace universe. Check the README for setup information! * Some basic story to enjoy! (1.1) Mission briefing cutscenes & introductions are now skippable with any key press. Some scenes remain unskippable. (1.1) Cargo containers now have about 50% less hitpoints, improving the speed of looting slightly. (1.1) Structure targets now have less HP, reducing the need to 'grind' through certain parts of the missions. (1.1) Primary weapons now have a wider impact sphere, making it easier to hit small targets such as drones and fighters. (1.1) Loot drops are now slightly better, improving the odds of getting more secondaries. (1.1) Your teammates will no longer get stuck in a 'dodging' loop, but as a trade off they will die easier. (1.1) Reduced the amount of texture layering in Hyperspace, hopefully improving the framerate a little bit. (1.1) Replaced the old sun textures with some new sun glows, with 3 distinct colors. (1.1) Changed the default explosion sound of NPCs and Rockets to match Basewars Redux. (1.1) The support ship now drops some Blaster Drones (Gunboys) at the start of missions. (1.1) Enemy bombers in the final mission will now be all destroyed when the carrier goes down. (1.1) In the training mission, Carey will launch a few more drones than before. 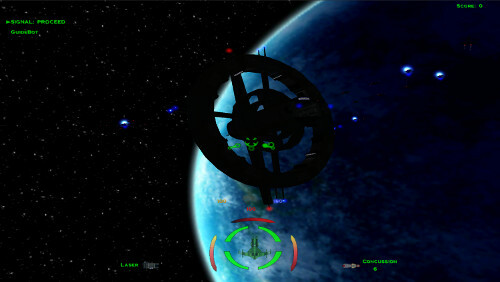 (1.1) In the training mission, the enemy fighter will succumb to the effects of Hyperspace faster. (1.1) Enemy waves will now switch targets correctly if their original target was not found. (1.1) Reduced the damage inflicted by Infested Drones (Mission 2), but they still hurt. (1.1) Sometimes the SUPPORT command disappeared. Now if this happens simply tap the support ship with your nose to get it back.